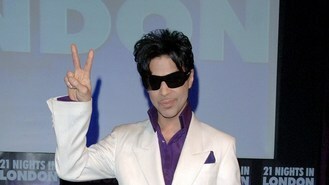 How did Prince close out South by Southwest Music Festival's week long showcase of rock n' roll? By naturally throwing a totally different kind of party: a grooving, brass band-backed funk fest that stretched to 3am and outlasted many fans lucky enough to get inside the exclusive show that also featured A Tribe Called Quest. As Justin Timberlake and the Smashing Pumpkins headlined other SXSW wrap-ups nearby, Prince prevailed as the toughest ticket on Saturday night by performing for only 300 people in his first appearance at the annual music festival that drew 2,200 bands and artists this year. Prince towered over them all - but his concert at the tiny La Zona Rosa club that sits on the fringe of the SXSW mayhem was no grandiose spectacle. He performed for two-and-a-half hours on a spartan stage behind a giant video board. He contentedly played band leader instead of superstar, often disappearing backstage for stretches as the band jammed. "They called our people and said they wanted some funk in Austin," said Prince, before belting out the last bars of a gentle rendition of Purple Rain. A 12-piece brass band joined the latest incarnation of Prince's New Power Generation for a run of hits like 1999 and 'Cool' that jammed with a soulful backbone. The show began with the band making a Mardi Gras-style march onto the stage, only to have their horn blasts drowned out by shrieks upon fans sighting Prince in a magenta, high-collared shirt and snug black blazer. Prince never played guitar during the set. Nor did he perform his new single Screwdriver that debuted earlier this year, opting instead for funk covers: Curtis Mayfield's We're a Winner and Michael Jackson's Don't Stop Until You Get Enough among them as the night dragged on and weary fans made their way to the exits early. "Don't make me hurt you. You know how many hits I got?" Prince said during the first of several pseudo-set closers, before launching into another encore.